As much as I love watches, I love the people who are occupied with our specialized hobby even more! And while our local group of watch pals organizes relatively frequent and highly convivial get togethers, there’s also something special about finding an excuse to go “on the road” to meet up with friends in places far from home. So, you can imagine that I immediately began scheming about how to route my travels through New York when I opened my inbox one morning several weeks ago to find the message shown below. Things got even better when I received a note from my friends at the F.P. Journe New York boutique asking me to go through my files and select a few photos of Journe tourbillons that could be exhibited at the event. I naturally found most of my prior images lacking, so I took the opportunity to create some new shots including some with more of an impressionistic flair than my usual highly literal efforts. With the preparation out of the way, all that remained was to wait for the appointed date and hope that my surrounding business commitments would not shift! Soon enough I was in New York and immediately headed for the Journe boutique to see whether anything was afoot there. I’m delighted I did because I had the good fortune to meet up with Pierre Halimi Lacharlotte, general manager of Montres Journe America and a friend. Pierre treated me to a quick tour of the special display of all of the generations of F.P. Journe tourbillons and finished up with a watch that for me is “The One”: Mr. Journe’s personal prototype tourbillon from 1991. I’d seen some photos of this watch before, but never thought that I would have the chance to see it in person, let alone have the opportunity to hold it in my hands and photograph it. I’ve often said that there are very few watches in the world that I would trade my entire collection for, but this is one of them. So imagine my joy at having it in hand. My only regret is that I didn’t take a shot of the back of the watch; like the back side of the moon, it’s something that few have seen. The primary reason I didn’t photograph it was because the reverse of the watch is a completely plain solid case back. The front of the watch is so exciting that it simply didn’t occur to me to capture the simple appearance of the other side. After a pleasant chat with Pierre and other Journe friends at the boutique, it was time to get cleaned up and head for the main event at the roof garden patio of the Gramercy Hotel. One of the most enjoyable bits of this event for me was that in addition to seeing old friends, I had the opportunity to meet several people whom I had previously known only in their virtual forms through online postings or email correspondence. Not surprisingly, we all hit it off immediately, fueled by both our shared love of horology in general and the particular mania that Journe’s work inspires in its devotees. Near the top of the list of my new friends: the self-dubbed @TheJourneGuy of Instagram fame, known for his encyclopedic knowledge of all things Journe, entertaining memes of Mr. Journe posted online, and extensive collection of different-colored Journe straps that he changes out on his watches on pretty much a daily basis. On this evening, he was double-wristing it with a coordinated pair that included a Chronomètre à Resonance and a Centigraphe. Since Journe tourbillons were the focal point of the evening, several of us with early Tourbillon Souverains made a point of getting together for some group photos; here the evening’s photographer caught us forming up. And here’s a shot that I was fortunate to get, showing early 38 mm Tourbillon Souverains with the full range of dial colors: rose, yellow, and white gold. But what of the photos that I had sent in prior to the event? Unbeknownst to me, the Journe staff had subsequently extended the photo submission invitation to others, and during the course of the week leading up to the evening reception had displayed the various images at the Journe boutique and polled collectors and other visitors to determine their favorite shots. The pressure was on! I held my breath as Pierre announced the winners and was delighted to hear my name called out as winner of the “People’s Choice” selection for my T30 Anniversary Tourbillon movement photo. I was also proud to hear that Pierre plans to display the winning photos in his office and even prouder when Mr. Journe congratulated me personally as he’s known to be a real stickler when it comes to photos of his beauties. And as an extra perk, the victors took home a lovely bottle of single malt Dalmore Scotch whisky. Not a bad haul! A final goodie for each Journe tourbillon owner was a scroll containing a technical drawing of the remontoir mechanism of the Tourbillon Souverain, and Mr. Journe capped off my evening by adding his autograph to mine. If the sense you’re getting from all of this is that the Journe organization truly values its collectors, I think you’re on the right track. 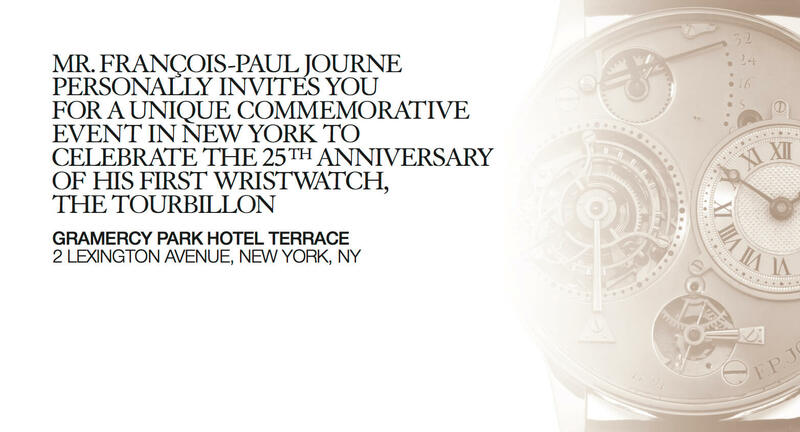 While members of the broader collector community and a number of journalists were also in attendance that night, the focus was clearly on celebrating the 25th anniversary of the very first Journe wristwatch in the presence of the brand’s loyal owners. At the end of the day, there’s pretty much nothing I would have changed about that evening. Well, maybe one tiny thing: of the photos that I sent to F.P. Journe, there was one that for me really sang, with a focus on the characteristic Journe winding crown and case construction, an indication of the early-production serial number, and a pensive mood. It wasn’t on display that night, but I’ll leave it with you here as my parting shot! For more information, please visit www.fpjourne.com/eu/collections/en/souveraine/tourbillon-souverain-1. Travel, great watches, interesting friends, cool photos, and a good story makes Q&P my favorite bookmark. We’re so glad you like what we’re doing, Jim! Thanks for weighing in, Jim — always great to hear from you here! That remontoire is pure Journography. Ha! Indeed, Ryan — and I will not hesitate to display it, either! This was a nice look behind the curtain. How fun! Keep it up! We love to see and hear from you. It is indeed hung in my office!